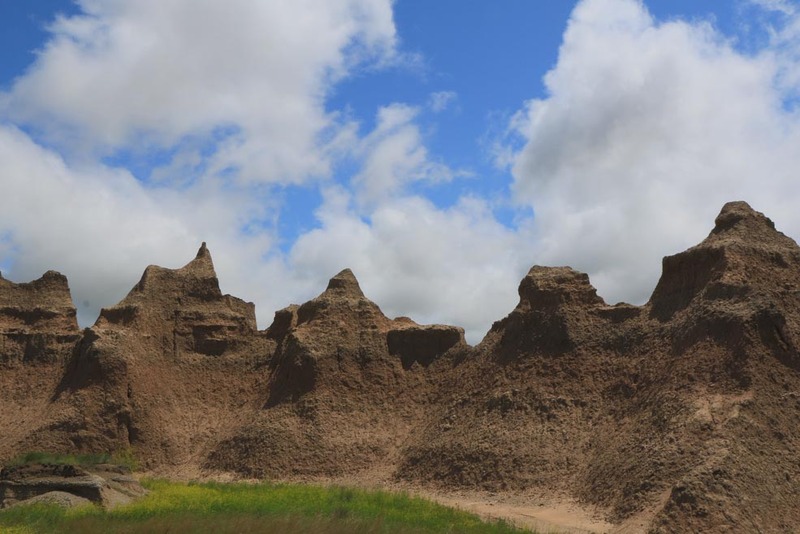 On Monday night, I was sitting in a campground on an Iowa interstate, swatting flies, monitoring the radio for tornadoes, and wishing we were back in the Badlands. 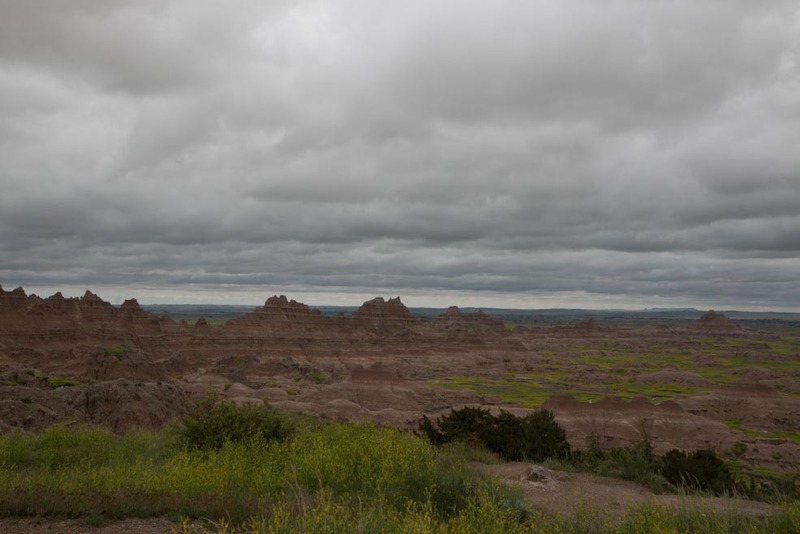 It had been a stressful day and the Badlands already seemed like a sweet, distant dream. 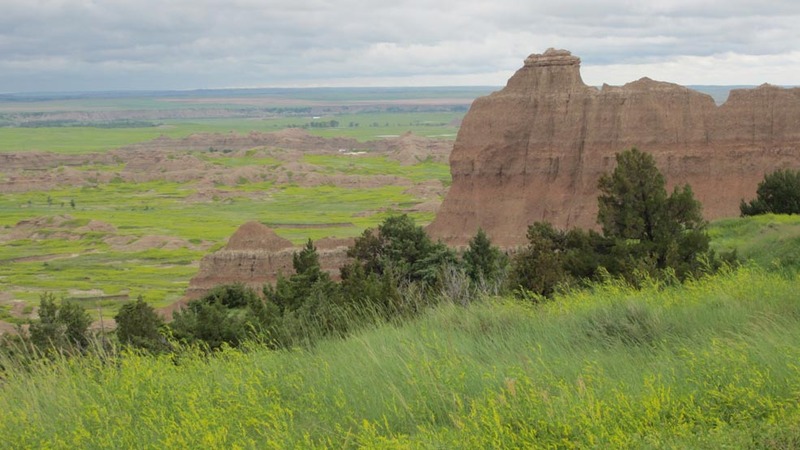 We took the back route (Route 44) from the Black Hills, through ranch land, prairie, and the southern reaches of the Badlands. 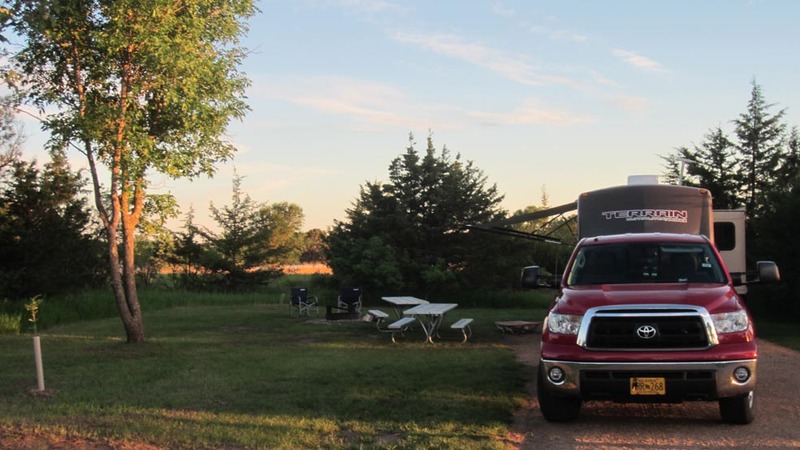 Our campground was our first KOA experience–in years anyway–and it was a good one. It was laid out in a loop of the White River, surrounded by an earthen dike and filled with birds. Swallows had mud nests under the overhang of the river bridge and swarmed up every time we drove the bridge. Thunderstorms moved in that night but they weren’t severe and made the trailer seem cozy with the rain on the roof. 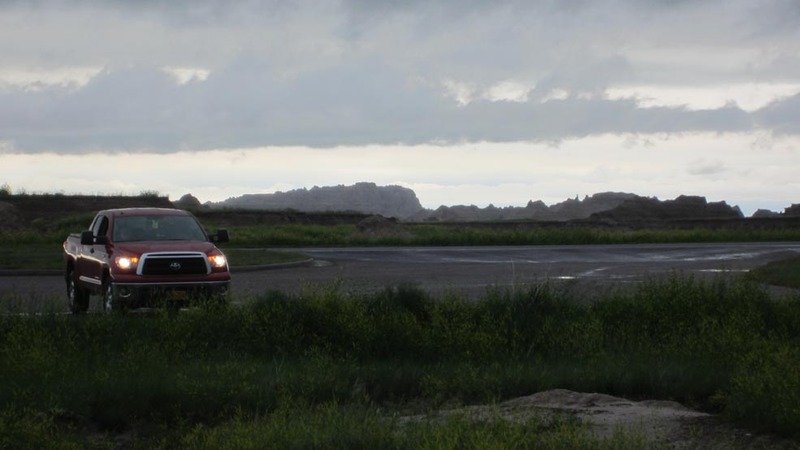 Early the next morning, we set out to drive the Badlands loop but got hit with some gusty winds and rain. It was actually quite lovely for a time, but when the lightning got closer and we climbed up to the prairie, we had to pull over and wait it out. I pulled up next to a tall van so that we wouldn’t be the highest thing around for a lightning strike. I know, ridiculous, but it made me feel better. The weather continued to deteriorate that morning. But the cloud patterns were a pleasure to watch. When the rain let up a bit, we turned around and headed back to the campground. In the hour or so we had been out, more than an inch of rain had fallen and the previously dry draws and creeks were rushing with water. 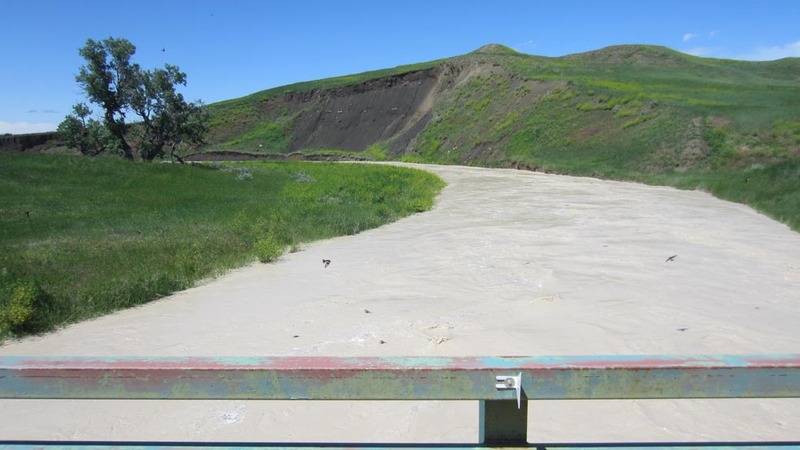 It was an in-your-face demonstration of how quickly a flash flood can develop, and fascinating to watch the transformation from arid, rocky gullies to gushing waterways in such a short time. By noon, the rain had passed and we set out again. The weather became exquisite, with the fresh-washed quality of air and light that you only get after a storm. 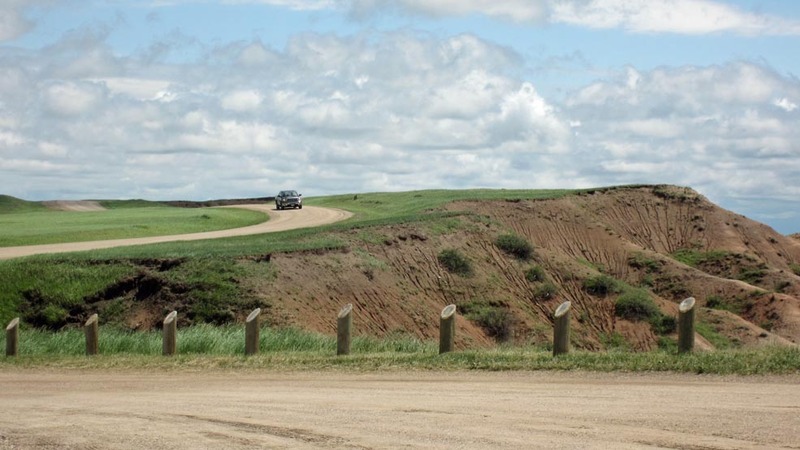 The main loop road was filled with weekend tourists and we decided to take the Sage Creek Rim Road, a dirt road that was in excellent shape despite the recent downpour. People are allowed to walk among the rocks and cliffs. No dogs allowed, though, even on the trails. The vivid yellow-green color is from the clover that covered everything. It’s an invasive species, but a gorgeous one. 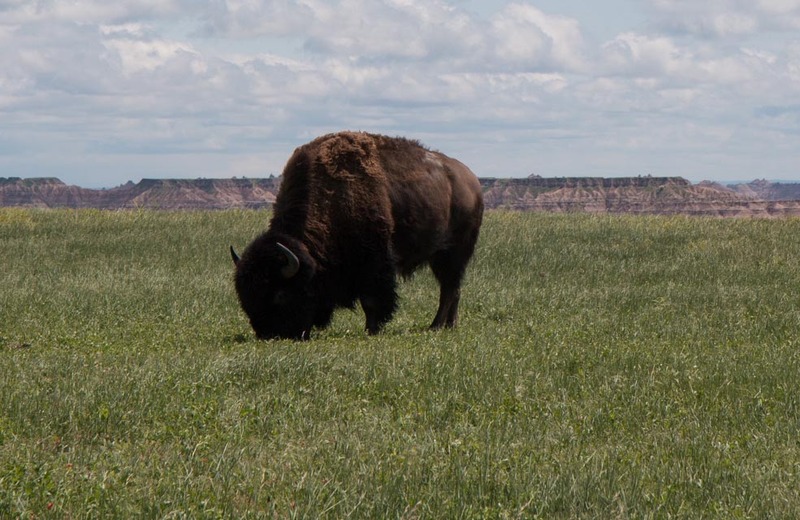 There were several groups of bison right next to the road, grazing and lying around. Startling to see them up so close. It was one of the nicest drives of our trip so far. 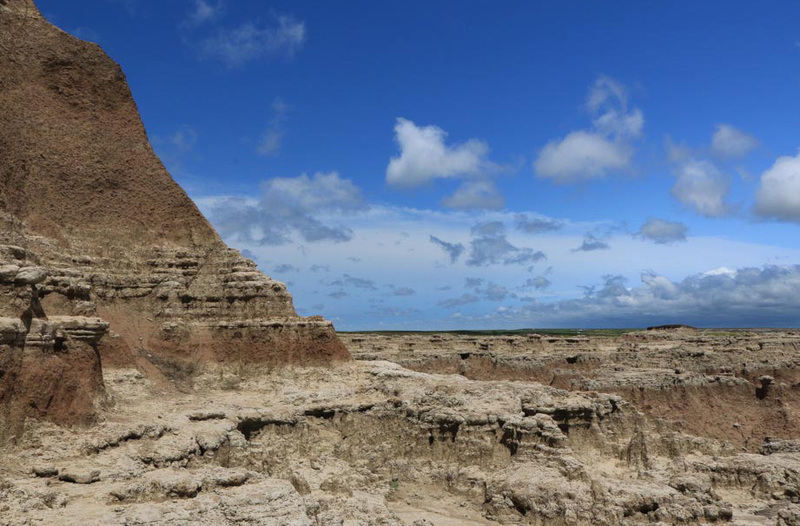 We left the Badlands on Sunday and had a beautiful drive across South Dakota, with a brilliant blue sky and small puffy clouds all along the way. We camped that night at Lake Vermillion State Park near Sioux Falls and enjoyed a warm, clear evening, oblivious as to what Monday would bring. 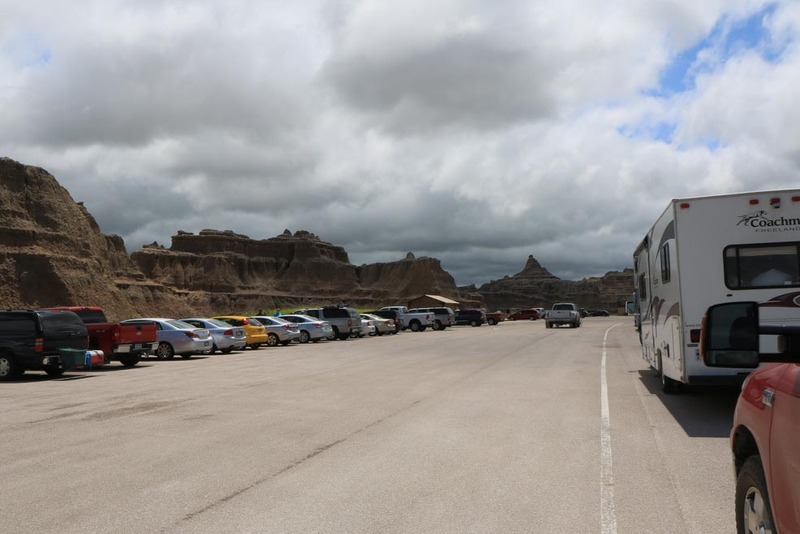 We planned to get an early start because thunderstorms were forecast for Iowa (where we were headed) on Monday afternoon and we wanted to avoid hitting the bad weather. Ha. When we woke up, there was a low overcast, which progressed to a very low deep gray schmutz hanging over everything as we drove further south. It just looked odd. 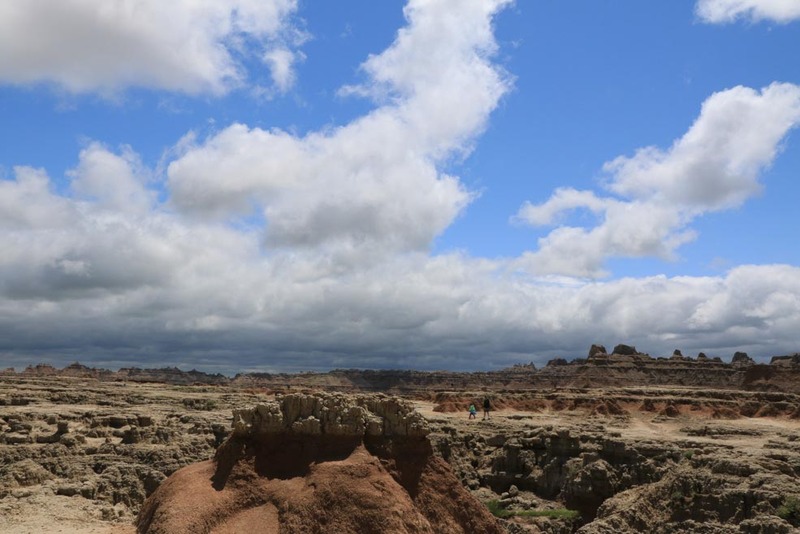 The Sioux Falls radio stations continued to give the same chirpy forecast of increasing clouds with a possibility of thunder showers in the afternoon. Nothing to give us pause. We stopped at the post office in Onawa, Iowa (right across the border from Nebraska) at about 9:30 to pick up our forwarded mail and the first weather alert came across the radio. A severe thunderstorm cell had hit Nebraska, southwest of Onawa, with reported 60 mph winds and–I kid you not–baseball-sized hail. It was headed in our direction. What to do? We are living in a tin can and extremely vulnerable to high winds and enormous hail. On the other hand, we can move. And that is what we did. After consulting with some locals at the gas pump, we hightailed it out of there and headed east and then south to avoid the storm front. It was a little dicey but we outran it and arrived at a campground near Iowa City in mid-afternoon when it looked like we would be safely out of the worst of it. About half an hour after we set up, a massive wind came out of nowhere and slammed into the park. From a minor breeze to a 50 mph gale in about a minute. It did not last long but, to use my mother’s expression, it scared the living daylights out of me. That rogue wind hit us at about the same time the two tornadoes hit Nebraska, just west of Onawa, in the same general area as the morning hail and wind storms. All of this mess arose out of one ugly storm front (deep red on the radar), which had hung around eastern Nebraska and western Iowa all day,slowly working its way northeast. As the evening progressed, more and more Iowa counties came under tornado watch. We had moved far enough southeast to avoid the tornado danger (we hoped) but were smack in the middle of the severe thunderstorm area. We had one storm cell move through at about 11 pm, which wasn’t too bad. But we went to bed with everything prepared to take shelter in the campground bathroom if necessary. Another storm hit at about 2:30 am and it was really frightening. I generally enjoy thunderstorms. This one was not fun. And the speed with which the wind arose was unbelievable. There was no time to do anything. We watched the red headlights of one, then two, vehicles drove over to the bathrooms, but I didn’t want to even run to the truck, the wind was blowing so hard. It blew down branches all over the park, and kept us awake for quite a while, but there was no damage to the truck or trailer, fortunately. We got out of there as quickly as we could in the morning and continued to head southeast, out of the worst of the storm zone. We were buffeted by strong winds all day driving, but finally arrived at a peaceful Indiana campground next to a cornfield. 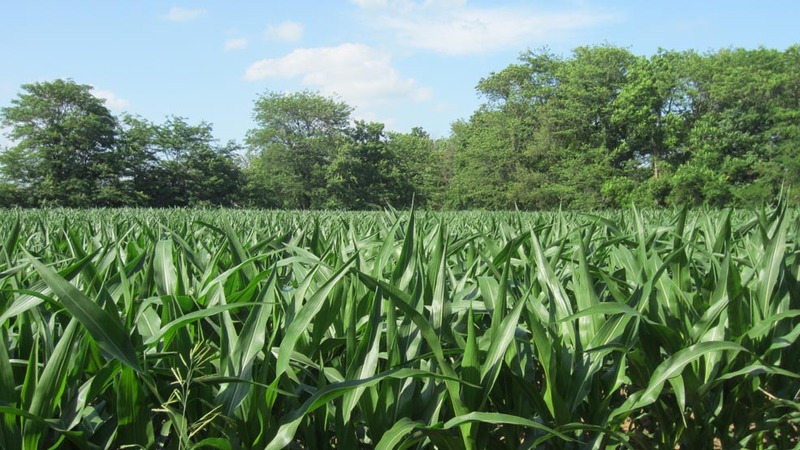 It was very hot—in the 90’s—“good corn-growing weather,” as they said on the radio, and sunny. A nice respite.